Science ministers and representatives from partner countries start the first experiment. International guests welcome the first users of the new major research facility. 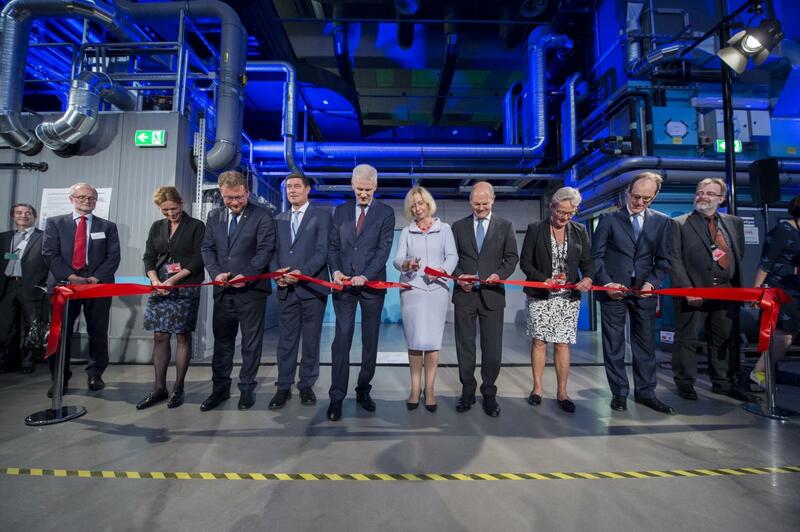 Speakers at the inaugruation of the European XFEL cut the ribbon in front of the hutches for the SPB/SFX and FXE instruments, officially opening the facility. European XFEL, the largest and most powerful X-ray laser in the world, was officially inaugurated today in an international event with musical and enlightening highlights in front of 800 guests. 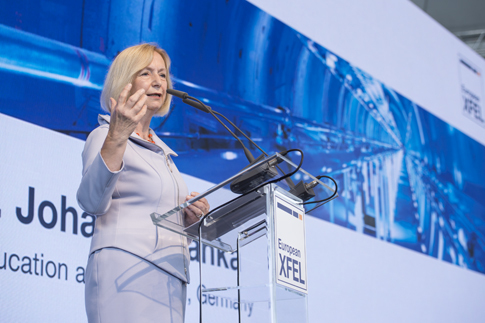 Research ministers and other prominent guests from across Europe joined the European XFEL Managing Directors to officially start the research operation of the facility with the first two experiments. See video of the ceremony here. German Federal Minister of Education and Research Prof. Dr. Johanna Wanka speaks during the inauguration. The European XFEL produces extremely bright and ultrashort light pulses. The facility will generate up to 27 000 pulses per second – 200 times more than other X-ray lasers. With the help of specialized instruments, these X-rays enable completely new insights into the atomic details and extremely fast processes of the nanoworld. Scientists will use these X-ray flashes to, for example, map the three-dimensional structure of biomolecules and other biological particles, and do so faster and with more detail than has ever been previously possible. Furthermore, single snapshots of particles produced with the X-ray laser can be sewn together to create “molecular movies” to study the progress of biochemical and chemical reactions – the basis for the development of new medicines and therapies or environmentally friendlier production methods and processes for extracting energy from sunlight. Other applications lie in the field of materials science with the development of new materials and substances, in the optimization of storage media for computers or the investigation of extreme matter conditions such as those found within exoplanets. Scientists from across the world will come to European XFEL to do their research by applying for access to the instruments via a selection process. 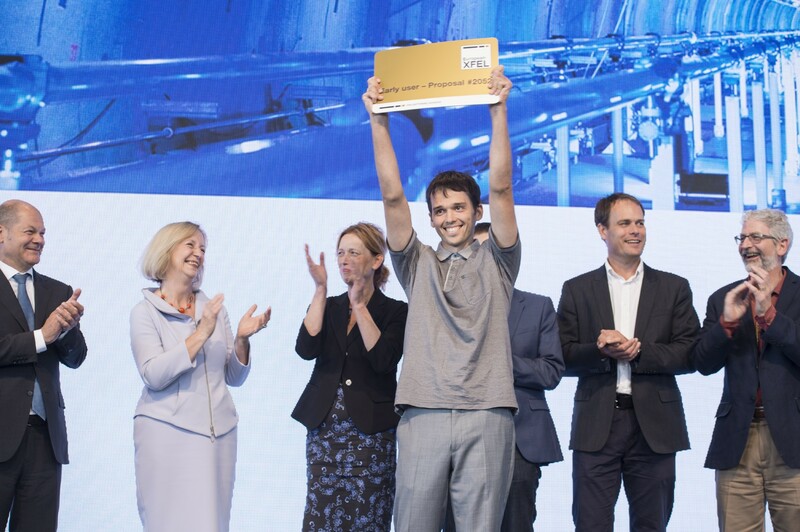 The assignment of the so-called beamtime, of generally one or two weeks per group and experiment, is awarded according to the scientific excellence of the submitted proposals. 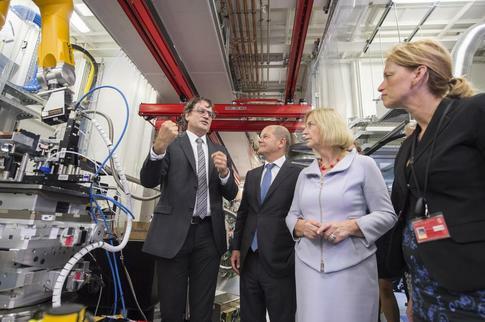 Together with Minister Johanna Wanka, Hamburg’s First Mayor Olaf Scholz, and Schleswig Holstein’s Minister of Education, Science and Cultural Affairs Karin Prien, European XFEL Managing Director Robert Feidenhans’l greeted the first external researchers of the new international research facility on stage. Scientists and their guests are currently busy preparing for the first user experiments at the facility, which will begin in mid-September. Alexander Guda of the Southern Federal University in Russia celebrates his status as one of the first users of the European XFEL with a golden &apos;entry cards&apos;. Europen XFEL scientists subsequently informed Minister Wanka and her guests about the experiments at the first two instruments in the underground experiment hall: the instrument FXE (Femtosecond X-Ray Experiments), which will enable the study of fast reactions and be able to record molecular movies, and the instrument SPB/SFX (Single Particles, Clusters, and Biomolecules and Serial Femtosecond Crystallography) developed for investigating the structure and transformation of biomolecules and other biological particles, such as viruses and cell components. Prof. Dr. Christian Bressler describes the FXE instrument to the guests of the inauguration event, including Hamburg Mayor Olaf Scholz, Minister Wanka, and Schleswig-Holstein Science Minister Karin Prien. At the FXE instrument, scientists explained the guests how the first European XFEL’s first snapshots of a chemical reaction will be done. The reaction will be triggered by an ultrashort pulse of visible light, while an X-ray flash, timed to reach the sample after the reaction is triggered, records the state of the molecule at that moment in time. During this first experiment, reacting molecules will be studied in a watery environment in order to learn more about the influence of water on the reaction itself. Minister Wanka and other guests begin the first experiment at the European XFEL in the SPB/SFX hutch. At the SPB/SFX instrument, the guests pressed the button to start the first ever experiment at European XFEL to determine the structure of a biomolecule. With this model experiment, the structure is already known, allowing the researchers to, for example, check whether the X-ray laser and the instruments are optimally coordinated. The first sample with unknown structure will come with users when they arrive for experiments at the facility in mid-September. Already every evening from 28 August, laser light beams can be seen shining across Hamburg from the Elbphilharmonie, Hamburg University, HAW Hamburg, the Hamburg Ministry of Science, Research and Equalities, and the Planetarium to European XFEL in Schenefeld as the City of Hamburg welcomes the international research facility to the metropolitan area. From 1 to 3 September, the laser installation will turn from green to blue as it merges with the Blue Port Hamburg installation.